In 1873 Tom West left Frieth and took up a teaching post at Dunsford in Devon in order to gain experience (and probably an increase in salary). Miss M. Gardner was appointed Headteacher in 1873 and stayed until 1877. 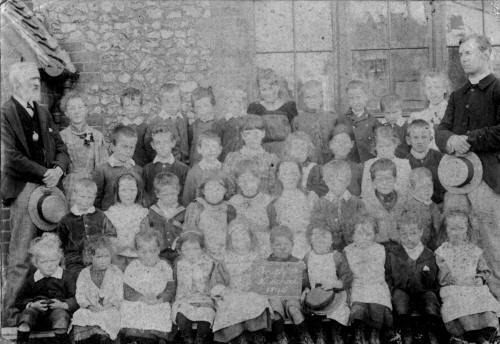 It was during this time that the Infant room was built and the school had to remove to Cutler's Farm, which must have been inconvenient and disrupting for her and her pupils, but from the few pages of yearly schedules that have survived, it would appear that Miss Gardner managed the school efficiently. She was assisted by two pupil teachers in training, Agnes Bruce and Annie Brazier. 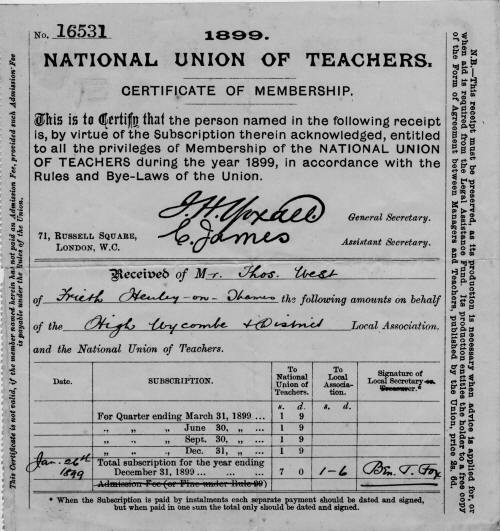 The agreement between the managers and Annie Brazier, and dated 1874, is interesting; her father Joseph Brazier could only make his mark (X) , she was to train for the next five years at a weekly salary of four shillings, increased by 1 shilling a week in each subsequent year. For this she had to teach 30 hours a week, pass a yearly examination and was liable to dismissal without notices for idleness, disobedience or immoral conduct. The Headteacher had to give the pupil teachers ten hours per week instruction, free, in her own time and theirs. "Thank you for answering my letter so promptly. And now I am going to astonish you! Miss Gardner is going to leave Frieth School and with the consent of the other managers I write to offer to you to come back and take charge of it. Things are different now from what they were when you left. 1. You have been away and gained experience in another school. 2. You have what I call 'Won your spurs', you have got your certificate. A great success with the school does you great credit and will I hope inspire confidence in you with all of us. 3. We must expect in future to have bigger boys at school than previously who will be better for a man's hand on them. So some of us think we had better have a master if we can. I cannot find a house – but I think your friends may arrange for you, either to be where you were before, or by exchange with one of the tenants of the Firm to occupy a house nearer the school. E. Cooper is now giving up the Sexton's place, and we cannot find anyone to take it. I know Mr. Turvey will not pay quite five pounds, about three I think – but the remainder may be got in some other services. Of course this is for your own services at the school 5 days in the week – for your wife to teach the needlework, yourself to teach the pupil teacher and Monitors ( we have one P.T. Annie Brazier – 2 monitors). You to play the organ when it is wanted, Sunday and other days. You to take care of the school premises etc. If your wife is disabled from attending to her duties, you to provide a substitute. After all I know this is not as much money as you look for – you may think, as I do, that it has advantages which are of money value." Tom West accepted the post and continued for 21 years, until 1898, when his health failed him. "England expects every man this day to do his duty." "To every tempter, every foe always boldly answer No." On the Village Green in front of the school, Tom West constructed a map of the world made of flints set in the ground. What a joy this must have been to children who had few books and no 'apparatus' as we know it today. 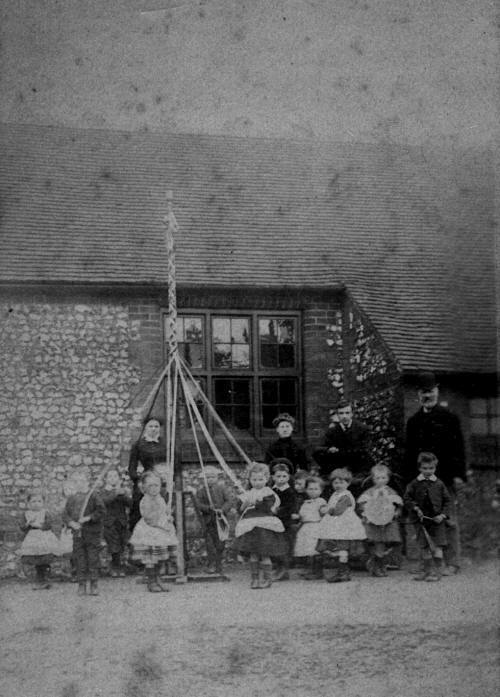 May Day customs and Maying could have been a survival from the distant past, particularly the inclusion of Jack O' the Green Boughs, but it was Tom West who taught the children to dance the Maypole. Probably this was introduced after his years of teaching in Devon. Having read Mr. West's log book and studied his collection of papers and yearly reports, I have been struck by the way in which, over the years, he battled against great difficulties with untrained helpers and very little equipment. He was adaptable to change and he never stopped learning how to teach. He acted on the yearly suggestions of the H.M.Is and widened the curriculum to meet the ever increasing needs of his pupils. In the early years the 'Three Rs' and the Bible were the only subjects taught by Mr. West and much of the learning was by rote. The Diocesan Inspector came once a year to test the pupils on their knowledge of the Bible, church teaching and the Catechism. "Plain holland overalls, Flannel petticoats, Coarse aprons, Shifts, Knitted cuffs, socks and stockings, Small drawers"
1879 : H.M.I. report "More books required"
1885 : H.M.I. report "The little ones need pictures"
1886 : H.M.I. report "Infants need some manual occupations"
1887 : H.M.I. report "Occupations of the Infants now fair"
1889 : H.M.I. report "Schoolroom is seriously overcrowded"
1892 : "The infants are learning the Maypole in their playtimes"
1893 : H.M.I. report "The kindergarten exercises should be given a wider range and greater variety and used more than they are at present to train the children's powers of observation. Some of the seats in the gallery are too high and the younger children not suitably seated"Musical Drill for the girls and boys mentioned"
H.M.Is' remarks on the building at various times also included "More books needed; a new easel required; more ventilation and light in the 'Offices'; walls need painting; a hole in the floor needs attention." By 1895 we can see that the curriculum included a wider range of school subjects. The subjects remained the same for many years, it was the way in which they were taught that changed. 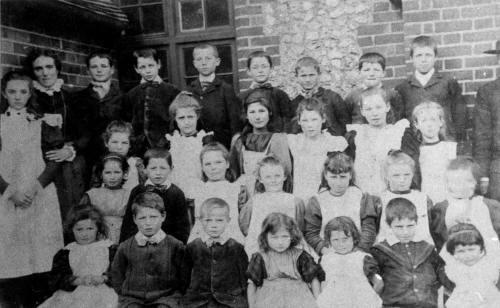 The headmaster was assisted by a number of untrained and unqualified assistant teachers and monitors – the latter were girls and boys who stayed on at school over twelve years of age and helped teach the lower classes. It was the master's job to teach these assistants as well as the children – this in his own time and theirs, after normal school hours. Some of the monitors went on to be Pupil Teachers. Mrs T West ? Arthur Leaver ? Fred Leaver ? ? ?
? Albert Leaver ? ? ? ? ? ? ? Arthur Edwards ? ? ? ? Mr. West lived with his wife and family in Flint Cottage (Note 11) an attractive flint and brick cottage facing the Village Green which, I believe, was built for him to rent by West & Collier Chair Firm. 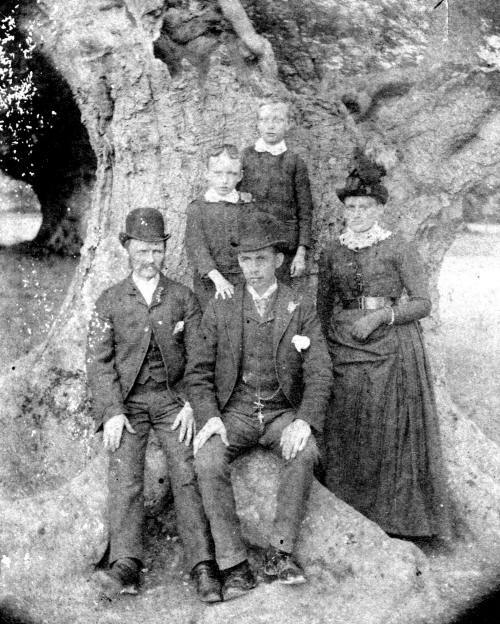 The West's had a family of six children: Cecil, Frederick, Mai, Ernest, Edith and Beatrice, most of whom continued to live in the village. When Frieth School celebrated its centenary in 1965 one of Tom West's great grandsons, Gareth Baldwin, was one of the pupils. In September 1898 Tom West was given leave of absence on account of illness, he never returned to school and died two years later. He had been well thought of by the scholars and parents, rector and School Managers. "Seldom have men so admirably filled the place in life to which God called them than he; and was not the reason of this that he devoted himself with all his heart and soul to the duties of his calling? He loved his school and the Church and Village; and as he gave himself to the service of these, so he gained by reason of this service, that growth in grace which rendered him the gentle, guileless, earnest, unworldly man he was." 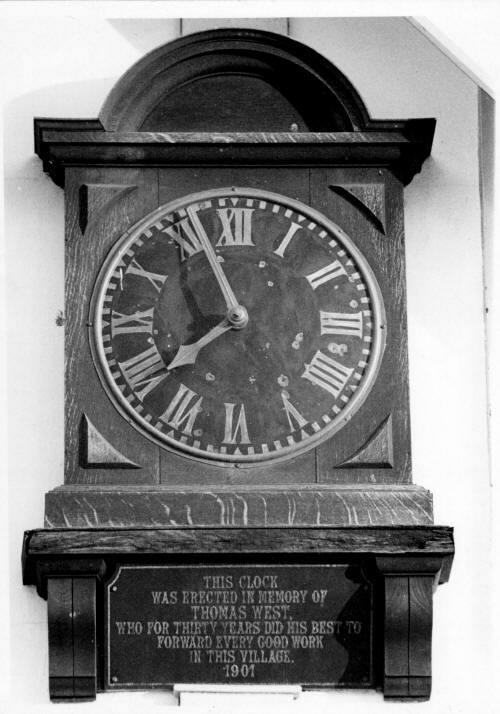 The clock on the Village Hall was given and inscribed in his memory. Click to go on to the next chapter "The Years 1898-1906"